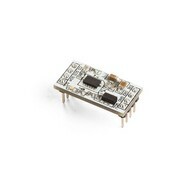 The MMA7455 accelerometer can measure acceleration in three axes. This sensor is commonly available as a breakout board that you can connect to your Arduino. It requires VCC, GND, SCA and SCL to be connected.